Sean Kelly Gallery is delighted to announce our second gallery exhibition of work by Brazilian artist Iran do Espírito Santo. Espírito Santo is best known for his sensuous minimal work that deals with issues of place, structure, material, design, and surface with a rigorous conceptual sensibility. Espírito Santo's exhibition is comprised of new sculptural works and a site-specific installation. 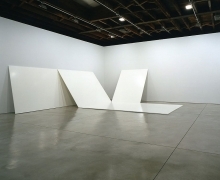 In the Main Gallery, Untitled (Unfold), a group of 6 large white aluminum panels lean against the walls and lie on the floor. 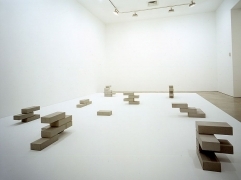 Referencing a disassembled box, the piece specifically addresses the differentiation between recognition of a concrete object and its seemingly meaningless components. The panels echo the walls of the gallery space that contain the work, creating a dialog between the "exploded box" and the enclosed cube of the gallery. Evasion, a 4-inch deep recessed rectangle, the size of a regular door is inset in the gallery wall, it alludes to architecture, domesticity and signification of an 'other' external space; the depicted space that lies in the realm of representation and art. The installation in the Main Gallery is completed by Can G, a solid stainless-steel sculpture of an ordinary household can enlarged by twice its volume, which is finished with a polished surface that reflects the environment in which it is installed. Debris, a series of 9 unique sculptures that seemingly represent fragments of brick walls, is installed in Gallery 2. Each piece is carved out of a single block of Pietra di Tuoro, a gray sandstone from Umbria. 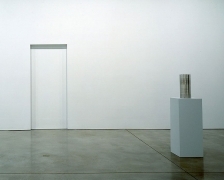 These works examine the idea of preordained composition implicit in ordinary construction, architectonic indices and structural fragments, however the sculptures are highly controlled objects that contradict the idea of remnants and randomness and demonstrate a desire for extreme control of our built environment. 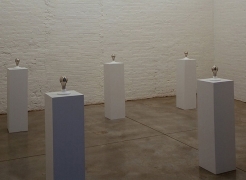 Gallery 1 contains 6 x 200w, a site-specific installation of solid stainless steel light bulbs screwed into porcelain fixtures displayed on plinths. The installation mirrors the functioning bulbs installed on the gallery ceiling and is part of an ongoing series of sculptures that deal with an investigation of light and the transformation of industrial design items into iconic minimalist sculptures. 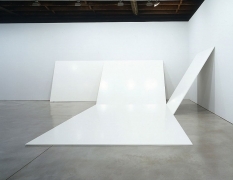 Espírito Santo has exhibited widely in museums and galleries worldwide; his works are included in the collections of many prominent international museums including the Museum of Modern Art, New York; The Museum of Modern Art, San Francisco and the Museum of Contemporary Art, San Diego. 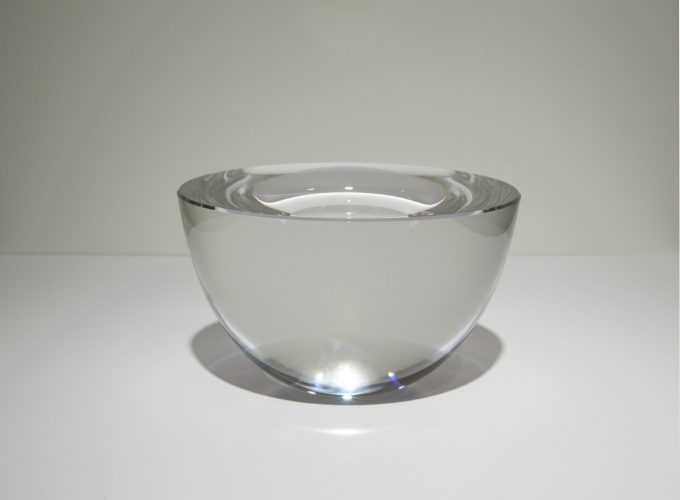 Espírito Santo's works have been included in the Venice Biennale, Venice, Italy, the Bienal Internacional de São Paulo, São Paulo, Brazil and the Istanbul Biennial, Istanbul, Turkey. Recent exhibitions have included: the Museo de Arte Carrillo Gil, Mexico City; The Power Plant, Toronto, Canada; el Museo del barrio, New York; the Museu de Arte Moderna de São Paulo, Brazil; the Museo Nacional Reina Sofia, Madrid, Spain and In Site'97, San Diego, CA / Tijuana, Mexico. In 2005 a major solo exhibition is being organized by MAXXI, Museo Nazionale delle arti del XXI Secolo, Rome, Italy that will travel to the Irish Museum of Modern Art, Dublin, Ireland.